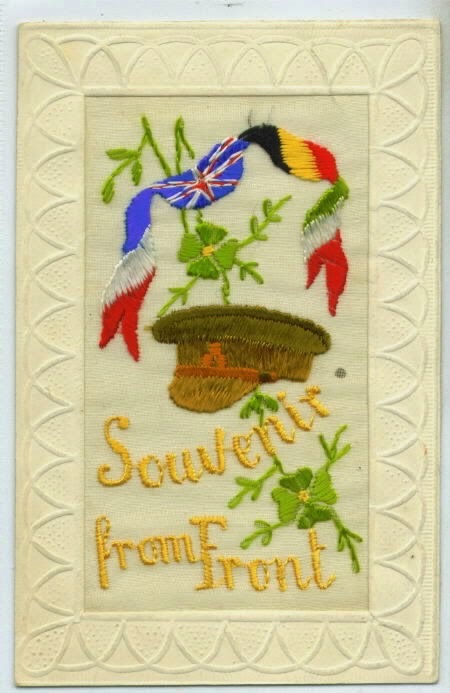 With this year being the centenary of WW1 and lest we forget those who so bravely fought, I thought I would talk about the stitching that men in the war used to do. Stitching for soldiers actually started in the Boer war but became more popular in the Great War. Wounded soldiers used to pass away the time whilst recuperating from their mental and physical wounds, a form of occupational therapy of the time. Some of these men became extremely good at embroidery. They made sweetheart pin cushions. Some were commercially produced kits but others were made from cloth taken from wool uniforms. Coloured cloth was decorated with beads, sequins, bits off mirror and pre printed panels with regimental flags. Some were even made from old feed sacks. 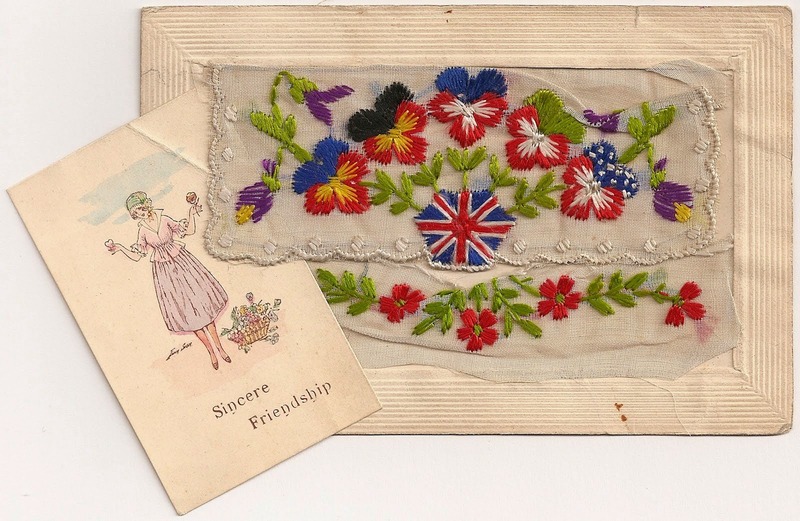 Also during WW1 embroidered silk postcards were very popular. They were made by the women of France and Belgium. Initially hand embroidered onto strips of silk mesh. Once completed they were sent off to factories where they were cut and mounted onto postcards. There were thousands of designs produced and were a thing of beauty in what was a terrible war. Some had little opening in the front and a small card was put inside to write on or with a message and in addition to that some contained beautiful hankies inside. These stunning postcards became popular keepsakes for troops and their loved ones. Can you imagine the relief to family, wives and sweethearts upon receiving one of these from time to time, it meant that their husband, son, brother or sweetheart was still alive. 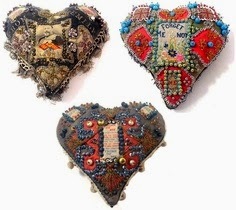 Sweetheart pin cushions, made by soldiers. example of one with a card that was inside. Men could write a little message for the their loved one on the back of the card. 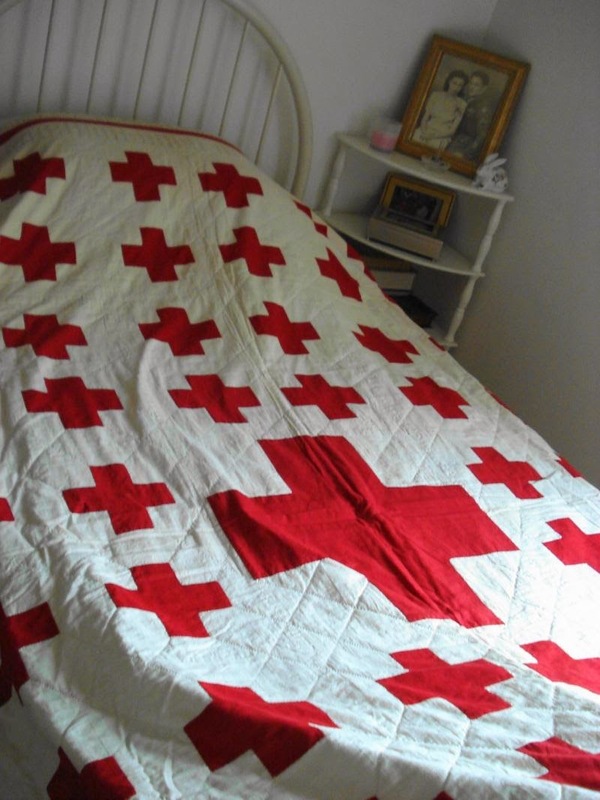 A red cross quilt that is believed to have been stitched by wounded soldiers recuperating. I hope you have enjoyed looking at such beautiful work, which was done by injured men. I always feel calm and happy when I am stitching, so I can imagine it brought peace to these chaps and took their minds to nicer places.